Once upon a time, there was a Hare and a tortoise living in a jungle. Hare was always arrogant as he ran faster than the tortoise. One day, the hare challenged the tortoise for a race. The tortoise agreed on that. They started the race. Hare ran briskly and seeing the tortoise behind he thought of taking rest as he was very much confident that tortoise can never reach the finishing line before him. He relaxed under the tree and fell asleep. 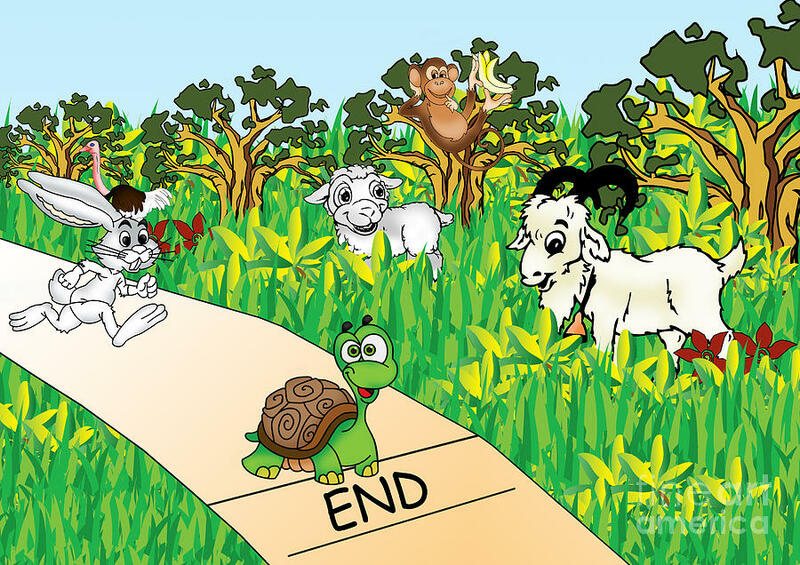 The tortoise kept on walking without any fail and finally finished the race. The hare woke up and realized that he lost the race because of him being over confident. This is a standard story what everyone knows. But the story does not end here. The Hare was very much disappointed with the race. He started self-introspection to find out the reason behind the failure. After realization that he was very over confident, and that is why he lost, he again challenged the tortoise for a race. The tortoise agreed and the race started. This time without taking any break, the hare won the race. Moral: Slow and steady is good, but being fast and consistent is better. But here also the story doesn’t end. This time the tortoise was disappointed. He was sure that in any case he could never compete with hare in the race. Therefore, the tortoise did some thinking and challenged the hare. However, the tortoise added one condition that he will decide the racetrack. The hare agreed because he knew his capability. The race started and hare without making any mistake he kept on running but at end point he come across a broad river. He stood there helplessly as he did not know how to cross the river. Meanwhile, the tortoise came and swam across the river. Thus, declaring himself as a winner. Moral: Know your core skills and talents; and change the game accordingly. Again, this is not the end of the story. Both of them realized their strengths and their weakness and started working on their abilities together. They decided to race again but this time as a team. The race started and the hare carried tortoise until the broad river. Harneet defines herself as a Wandered Soul. Her first love is travelling. She loves wildlife. She believes in Spirituality. With the strength of her family at the back, she wants to explore the whole world. She likes telling her traveling tales and that is how her love for writing started.